I missed the Meadham Kirchhoff AW13 show, ‘Helter Skelter’. It was about devotion, and I was skiing. The first thing that came to mind when I caught up on the collection was these photographs of contemporary churches by Christoph Morlinghaus, probably because the concrete surroundings of the Tanks at Tate Modern, where the show took place, were visually quite similar. * I love the cold, morbid glamour of this collection. There is a definite atmosphere of recently widowed Italian dame, while the gold and silver shoes give a lovably schoolgirl-ish feel to the lower-half of each look. The first looks didn’t grab me particularly, but from the collection as a whole there are elements which I quickly picked out and adored just as soon – the crowns, shoes and veils especially, which seem to be harking back to previous Meadham Kirchhoff innovations in new, equally beautiful ways. I am ‘interviewing’ Edward this weekend, so it will be interesting to see his inspirations for AW13. The Rookie studio visit each season is almost my favourite part of each new Meadham Kirchhoff collection, and I am hoping they will post some photos of moodboards etc. too, because Edward told me today that they will all be gone when I visit. I too explored the concept of devotion in my last art project, which linked fashion with religious iconography. It was originally inspired by my love of Meadham Kirchhoff and fashion in general, and also by the interesting way in which Ben and Edward have often used the shrine motif in their sets. Their veiled AW10 collection rather coincidentally cropped up in my references alongside my own drawings of veiled life models in the style of the Madonna, so perhaps we have been thinking along the same lines for the past few months…? 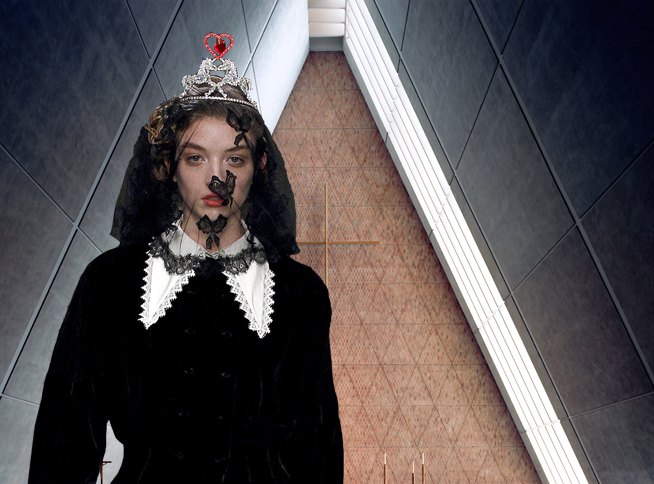 This entry was posted in Architecture, Fashion and tagged Meadham Kirchhoff, Photography, Womenswear. Bookmark the permalink. Is The Rookie good? So many things on the internet to keep on top of… I’m really growing into a MK fan. I was going through too much of a minimal phase before to truly appreciate them, I think. The Rookie Meadham Kirchhoff seasonal studio visit is the only thing I go on there for because it is geared towards teenage girls, but for the photos of moodboards etc. from the MK collections it is absolutely amazing! Edward usually provides a ‘commentary’ although he told me he skipped that part for AW13 so it is just visuals with a review by the Rookie writers this time… I have no idea who you are but it is exciting to hear that! I feel like I am almost going in an opposite direction – I still love Meadham Kirchhoff but I am trying to control the amount of colour in my wardrobe at the moment! Why did my comment come up as anonymous?? I filled in all the details. Ha! omg I was wondering who it was… I have no idea, probably just wordpress messing up. I know WordPress gives a lot more control over design and can make a blog look a lot more professional with less effort, but I do find the way it handles comments annoying… Every WordPress blog seems to have the same comments fields, yet each new blog doesn’t ‘remember’ my details and I have to type them in again. And it isn’t compatible with my Google or Twitter or Disqus accounts. And it doesn’t auto-email you replies. It’s my one issue with WordPress.